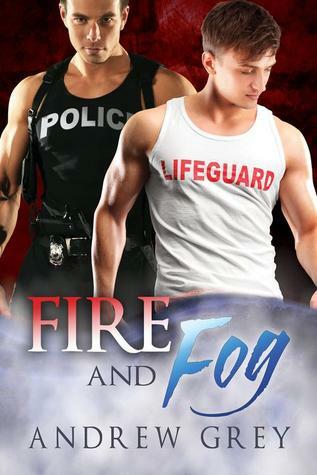 Fire and Fog’s the sixth book in The Carlisle Police series by Andrew Grey. I’ve had the pleasure of reading the first and the sixth book in the series, and I just picked up books two through five, and I can’t wait to read them. Fire and Fog’s well written and nicely edited. The characters have depth and have been developed. The storyline and plot had a couple of twists that I didn’t see coming, but the book did move slowly at times, and I would find myself gazing off into the distance before focusing back on the book. Luckily that only happened a couple of times. The books do look like they are standalone stories as I didn’t have any problem following the storyline and figuring out who was who. I did find reading the first book enhanced my reading experience though since Officer Dwayne is partners with Officer Red from the first book and his partner Terry ends up being Robin’s boss at the Y. I did enjoy getting to see more of Red and Terry, and there are more cameos of the other couples at the Bronco’s Club where Dwayne and Robin meet for the first time, but they are just small cameos. Officer Dwayne has just moved to Carlisle and been hired by the police department there. He left his old town when they found out he was gay and harassed him until he accepted a severance package from his old police department and left town. His parents’ want him to come home but only if agrees to play straight. Dwayne isn’t willing to go back into the closet for anyone. Especially when he can’t have the job he loves if he goes back. So he does his research and finds a police department that’s gay-friendly, and that’s how he ends up in Carlisle. Dwayne has a soft spot for helping people in need, and he’s a good judge of character. Robin’s just been kicked out of his house by his stepfather when he found out Robin was gay. Robin’s always hated his stepfather so no hardship there with leaving, but he can’t get over how his mother didn’t stick up for him. When he loses his job, he turns to hustling to pay the rent and buy food. Of course, while trying to pick up his first client, he gets caught by Police Officer Dwayne who just happens to be at the Bronco’s Club at the same time. Robin ends up getting saved later in the evening by Officer Dwayne when his client roughs him up and tries to get more than what he had paid for. Officer Dwayne takes him home only to find out that Robin’s been the victim of a renting scam and has been evicted by the real owner of the building. Officer Dwayne ends up taking Robin home with him, and their relationship slowly progresses from there. The story has a nice slow burn to it with plenty of steamy scenes with a real life feel to it. I enjoyed reading it and watching as Robin and Dwayne bring out the best in each other and build a family of their own to replace the crappy family that they had both been dealt with. I can’t wait to read the other books in the series. Another great book by Andrew Grey.